The town of 'Muqdadiya' district, northern of 'Diyala' province, where dozens of people were killed as a consequence of military operations took place on 26th of last January. IMH observers noted the contrast and split of media coverage of the incident as an example of one of the issues that have witnessed a huge argument and contradictory information that soon and clearly reflected in public opinion, as well as neglect of the necessary professional journalistic standards. It is clear, that the coverage based on charging different parties according to sectarian addresses, without providing adequate information as an evidence of the charge. Monitoring Report focused on the way the media coverage of the incident in terms of sources, method, and expression of coverage, and how to prosecute developments related to the general context of the incident, over the official and media levels. Over first three days of the incident there were no official response issued on behalf of the three presidencies (Republic, Government, Parliament), with the exception of a press conference held by deputies of the ‘National Forces Alliance’ includes Parliament's Sunni forces, condemned the incident and accused militias of killing more than 70 of 'unarmed civilians'. Then On the 29th of the same month Prime Minister 'Haider al-Abadi' announced a statement of forming an investigation committee including ministries of interior, defense, and the competent authorities to look in the incident, and one the day after, Iraqi parliament also announced a formation of a commission of inquiry, headed by 'Hakim Al Zamili' the Chairman of Parliamentary Committee for Defense and Security. Then, hours after, the Special Envoy of the United Nations 'Nikolai Miladinov' welcomed the governmental step 'It is the government's responsibility ensuring the subordination of all armed groups within its control, this enshrines the respect of rule of law', said Mr. Miladinov during a press release. On 2 February, Mr 'Saleem Al Jubouri' the speaker of parliament, and a member of the 'Union of national forces' called for speeding up the disclosure of investigation results, 'al-Jubouri discussed the course of inquiry with the Defence Minister Mr 'Khaled al-Obeidi'', as stated in a statement issued by his office. On the 5th of February the government issued a statement, followed the preside of Mr 'Al Abadi' of a meeting with Commission of Inquiry included ministries of interior and defense, in which stated 'Abadi briefed on the preliminary investigation results as he instructed to follow up this issue, accelerate the disclosure of results, and to hold the perpetrators and bring them to judiciary'. Despite that Mr Al Abadi speech contained an indication that confirms the crime, the majority of media did not pay attention to the crime, even did not refer to it the way that official bodies have responded. On 20th of March the speaker of parliament 'Mr Al Jubouri', announced through an official statement that he received a report about the incident, 'The Speaker of Parliament formally received the final report of the committee in charge of investigating the massacre Barwanah in Diyala province', as stated in the statement. This incident had passed in local media through several stages and stories. On the day it happened, it was said that the perpetrators belong to Arab Sunni tribes, who repudiated in 'popular crowd forces' garb, weapons, and vehicles and killed the victims as a motivation of tribal revenge in the context of military operations that 'Diyala' witnessed against ISIS, without specifying the place, but announcing the death toll, which amounted 40 people. Some political and security affairs followers named some of those tribes explicitly, while there was no declaration on the results of government investigations. Later, according to testimony of security officials in Diyala, it was announced that the crime scene was 'The Big Barwanah' village, which lies outside the zone of military operations in Diyala province, out of areas controlled by ISIS, it was originally safe, located amid Shiite villages, as it became a haven for displaced people from Sunni villages where combat operations. The agencies that emerged in the comprehensive coverage were 'Al Mada Press, Al Mada newspaper, Qurtas News, Iraqna news network, Al Sumaria News, and Al Baghdadiyah which covered the incident since the first day and published news on its various bearings, followed by security officials statements that assigned the crime to ISIS militants, as well as contradictory statements by 'Diyala' governor Mr 'Amer Al Majmaiy' and the speaker of parliament Mr 'Saleem Al Jubouri' plus the deputies of the Union of national forces who accused the militants in this crime and demanded for necessary investigation and arrest perpetrators as well as the accountability of the security leaders. Al Mada newspaper published ‘Reuters’ report about the visit of its correspondent to the village where testimony of survivors and people who were close to scene were documented; witnesses said that people were traveling in shaded cars and military 'Humvee' vehicles carried out the killings mission; the report also included the number of victims and the way they been killed, after being taken to a secluded house in one of the orchards and then being executed. The report coverage also included a statement of Badr Organization leader 'Hadi Al Amiri' to 'Reuters' who denied the responsibility of popular crowd for the incident, as well as a statement of the President of the parliamentary Commission of Security and Defence 'Hakim Al Zamily' for reporters accompanying him during his tour in Diyala in which he said ' There are traces of ammunition on bodies of the unidentified dead’, hinting that they belong to ISIS militants. Qurtas News republished a report of ‘Middle East’ newspaper, which contained testimony of survivors who said the same facts published by "Reuters", noting that the attackers killed the victims as ISIS militants fleeing from combat zones that controlled by popular crowd forces. Al Saumaria News website, published reports included all governmental statements and conflicting stories of various parties about the responsible side of the crime without any additional comments, with an obvious tendency to the use of more conservative terms. Then Baghdadia and Baghdadia News Channel come to less extent of interest in chasing developments of the case. Al Zaman concluded the report by referring to a particular source of the newspaper who imputed the accident to tribes’ revenge of those who cooperating with ISIS displaced from villages of 'Snisil' area. There was a brief coverage by Iraqi Media Network and Iraqiya channel and Al Sabah newspaper that ignored the incident on the day it happened and did not focus on the decision of the Prime Minister 'Al-Abadi' regarding formation of investigation committee, also it completely ignored the comments of Diyala province governor 'Amer AlMajmaie' and Parliament Speaker Salim al-Jubouri who accused militias in the incident, as well as it did not follow-up the visits of Minister of Defense and the Chairman of security committee of the village who accompanied with reporters, but merely published indirect simple signals. The channel hasn't mentioned Barwanah village name, only during the news context about the visitation of Minister of interior to 'Diyala' for field inspection on security situation, and his pre commitments to the speaker of parliament regarding the dismissal of the security leaders who caused the incident, and it repeated in the same report 'Diyala' police commander statement 'ISIS is behind the incident' in order to offend to security forces and ignite sectarian flames in the province." The news websites AlFurat News, Buratha, as well as Ittijah, Biladi, Furat, and Ahd, as well as media in the central and southern governorates, have focused on the statements of local and security officials who denied the charge of 'popular crowd'; the incident was reported briefly, then its developments were neglected to follow up, while the crime and the investigation committee haven't been mentioned at all. Afaq channel has reported news brief about the Secretary of Defense visit to 'Barwanah' village, while Fayhaa channel broadcasted a report on the head of the Security and Defense Committee visit to the village, and his meeting with its people, with truncated clips of the statement of him there, to support the story it adopted, which provides ISIS is in charge of the incident. Buratha website has published news on the announcement of Prime Minister to form a commission of inquiry, and the visit of the Minister of Defense and Chairman of parliamentary committee of Security and Defence to the scene, but it was keen to highlight the statement of Zamili on considering the undefined victims from outside the village and the prospect of being members of ISIS. Iraq Al Qanoon website has reported news included the Prime Minister's decision to form a commission of inquiry, and the MP Hadi al-Amiri leader of the Badr Organization denial of popular crowd responsibility of the incident. The website published an article written by 'Mazhar Kazim' in which he said that the dead in Barwanah were not peaceful civilians, but loyal to ISIS, and he held a comparison between the 'provocative media attention on this incident, compared to Spyker and Saqlawiyah incidents. Al Sharqiya and Taghyeer channels, Iraqi news agency, kitabat website, and the news agency have addressed reports and news about the incident from the first day, and the coverage escalated, they focused on large parts "Reuters" report, and formulated the news by accusing Iran's Revolutionary Guards at times and armed militias at other times. And with the formation of the incident investigative committee, they questioned through reports of the competence of Committee to end up with an impartial report. Other reports hinted a local official in ' Abe Saida' area nearby Barwana regarding ​​the incident as well as earlier incidents in Diyala, and accused him of threatening the families of the deputies of Diyala province, including the parliament speaker Salim al-Jubouri, and members of the parliamentary committee of inquiry, and quoted statements of some of those accusing the Interior Ministry of obstructing their efforts to uncover the truth of the incident, according to the news agency website. Additionally, Al Sharqiya channel has published reports in stating that the militias continue destroying houses and burning orchards on the eve of the departure of Ministerial Committee which visited the province, also posted brief video clips as exclusive horrific scenes 'according to the channel', which show bodies of victims scattered in between the houses and orchards. Kitabat website has published a quoted report from the news agency website, under the title "armed militia leader, a head of the investigation committee of Barwana massacre" in which the inquiry committee was accused of lying and questioned the integrity of its chairman MP 'Al Zamily', who accused him of trying to blur the truth by convinced publishing that the victims from outside Unlike the dead relatives certificate. The report also included a speech of one of the victims' wives during testify in front of investigation committee members who demanded her to describe attackers, and when she failed because they were masked, they asked her if she accuses the "popular crowd" forces at a time there were a number of these forces was in place. 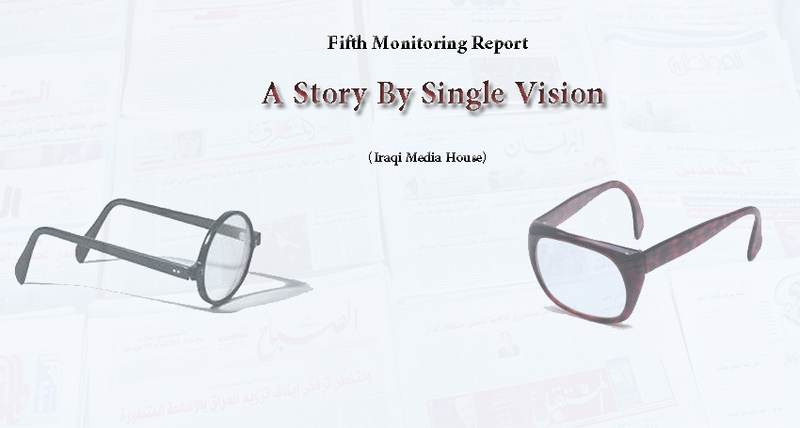 Our monitoring report included Arab and foreign widespread outlets that covered Barwana incident. ‘Reuters’ published the first report on the incident included interviews with witnesses and people said they were close to the scene, they indicated to culling more than 70 unarmed people by the militias, and published by local media report the agency to cover the incident. The Middle East newspaper published a report on the incident, indicated that its correspondent visited Barwana village on the 5th of February nine days after the incident, and based its report to meetings with witnesses, dead relatives, local officials, tribal leaders, and Chairman of the Parliamentary Committee on Security and Defense. The majority of Arab and foreign media, such as ‘The Washington Post’, ‘New York’ and ‘Al Quds Al Arabi’ hired reports which published in Reuters and The Middle East to cover the incident, in addition to the governmental and official statements noting the absence of their own reports production. It was noted that Arab and foreign media did not adopt reports and news from local media for the incongruent about the incident. Ittihad, 'the United Arab Emirates newspaper', Al Ghad, Al rai 'the Jordanian', and Al Nahar 'the Lebanese' addressed brief news on the incident. International Arabic-speaking websites clearly focused on incident, where the German satellite channel "DWS" covered the incident with several reports, while Sky News, BBC, CNN, and France 24, mainly hired the report of Reuters news agency. The absence of the field work for the local media, which preferred to focus on the statements of officials, and the absence of interviews with residents of the area or families of the victims, but a full reliance on international news agencies and Arabic press reports. Many media ignored reporting the incident in several publications, news, and reports, except in the context of statements denying its occurrence or eliminate the charge of a particular party, that made way for other media in condensing its coverage to the incident in context of many of contradictory versions. The lack of precision in most of local media coverage of the incident in terms of death toll, as some media have tried to reduce the number, while others sought to increase the number to hundreds. Some media quoted video clips that posted on the Internet regarding the incident without validating, in addition to relying on news and information that has been traded on social networking websites. Media split in official responses coverage in the incident, some of which focused on the situations in which the militias accused of committing the incident, and others focused on the attitudes that deny charging the popular crowd; in contrast, accusation of any party to the incident through media came in incomplete manner and without reference to reliable information, in what appeared as a media coverage of political qualifiers. Some media attempts of interpretation and truncate statements the way they harmonize with their political, and orientation partisanship, what was remarkable in phenomenon of news reports and statements quotation with rarely mentioned sources. Media did not pay attention to the outcomes of the official investigation, some of them pre-empted results of investigation by releasing accusations without evidences, while media completely ignored the statement of the Prime Minister Haider Al Abadi which acknowledged the crime and demanded the punishment of perpetrators. Obvious weaknesses by prosecuting the developments of incident few weeks after, and merely obtaining information from official statements. A statement by the head of Iraqi parliament confirmed on the 20th of March that the Speaker of Parliament had received a final version of Barwana incident investigations, but the parliament has not published the report until time of writing this report.